This is Markie. He's a little old man, so he gets special treatment, going for walks in a stroller made especially for small dogs. 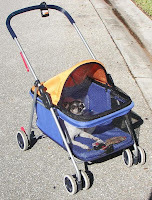 There are several doggie strollers in the community. Sometimes the owners bring the stroller along on walks just in case the dog gets tired and wants a ride. My son used to tell me about the designer baby strollers he would see as he walked Central Park near his home on the Upper West Side of New York City, but I bet he never saw a doggie stroller! Next I met Riley and Marina. They are Portuguese Water Dogs. At two and one half years, Riley is the younger of the two. They were very friendly and well behaved - so much so that I actually felt very comfortable with them. This breed dates back to around 500 AD when fishermen used them to herd and catch fish, retrieve things that fell overboard and guard the ships when in port. They are excellent swimmers and their owner showed me their webbed feet. He said the best thing about them is their coat. They do not shed. I hope I see Riley and Marina again. This cute grey squirrel (or as Bill would call him - a sport model rat) was just sitting in a tree looking at me - almost asking to have his picture taken. 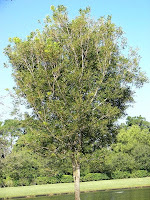 Just outside our lanai we have this beautiful Mahogany tree, the national tree of Belize. I learned it is an endangered species here in Florida. 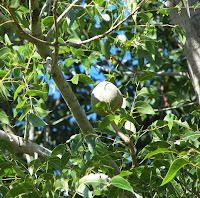 The fruit (or is it a nut??) looks like a dull brown tennis ball. According to what I could find online, it is an evergreen. I like that it blocks the late day sun. I saw lots more this morning that I wanted to photograph, but the battery in my camera needed to be charged.